Safety valves not only act as switches, but more importantly they protect the safety of the equipment. The opening and closing parts are normally closed under external force. 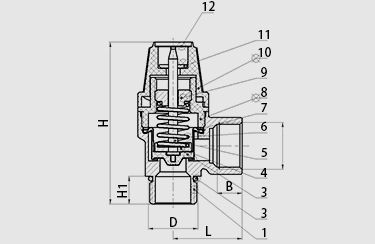 The opening and closing parts are normally closed under external force. When the medium pressure in the equipment or pipeline rises above the specified value, it will discharge the medium outside the system to prevent the medium pressure in the pipeline or equipment from exceeding the specified value. The connection type is female thread x male thread.